CMS Design Company brings us this super easy, and super stylish knitted baby vest. Look how cute this is! Definitely going in my queue for the next “baby thing” I have to knit! This is so cute! I would love to make one but I must be missing something. I can’t find a pattern on the link. I LOVE the lamb buttons. I’m sorry but the pattern is not mine to post. 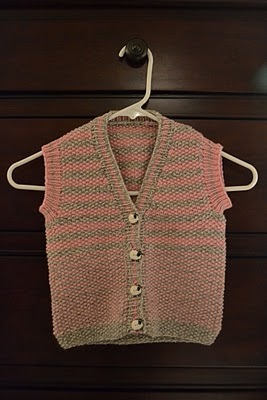 I’m sorry for any confusion – I knitted this baby vest using a pattern from my knitting teacher and I wanted to share the results of my work.